This drink features one of my favorite new ingredients, Dimmi liqueur. Made in Milan, Dimmi is flavored with peach and apricot blossoms, grappa, and other botanicals. It has a light fruitiness that pairs wonderfully with pisco or other fruit-forward spirits. 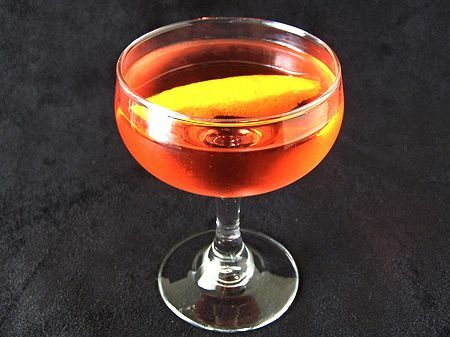 It also goes well with its better-known Milanese cousin, Campari. Together with the often-overlooked white port and blanco tequila, this slightly bitter cocktail makes a good aperitif. Stir together the liquid ingredients, strain into a chilled cocktail glass, garnish with the orange twist, and serve.